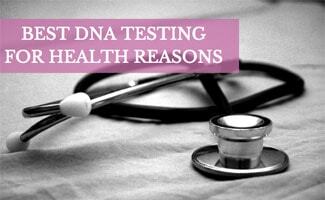 Best DNA Testing for Health Reasons: What Can You Learn? Home > Health > DNA > Best DNA Testing For Health Reasons: What Can You Learn From At-Home Tests? Direct to consumer genetic testing is a booming business these days, but are these tests legitimate? Yes… in some cases. Many at-home DNA tests to determine ancestry, as well as several paternity tests are legit. But what about at-home DNA testing for health reasons? This is where caution is key from a consumer standpoint. Various types of DNA health testing kits on the market claim to determine your predisposition for diseases and carrier status, give you your cellular age, or analyze your DNA for weight loss and fitness purposes. Are they worth it? And are they actually accurate? See what we’ve uncovered before putting a dent in your wallet. 23andMe is the only at-home health DNA testing that’s approved by the U.S. Food and Drug Administration (FDA) for genetic testing for disease predisposition and carrier status. 23andMe has been offering DNA testing for medical purposes for several years now, but in April 2017, the company finally received FDA approval for several of its testing reports. How does it work? What FDA-approved tests can you order online? And what will they tell you? All you have to do is order 23andMe’s $199 Ancestry + Health kit online. Once your saliva collection kit arrives at home, you spit in the provided tube per instructions, register your test kit online, and send in your sample in their pre-paid package. You should receive your results within six to eight weeks. 23andMe’s DNA test for health issues also offers more than 40+ FDA-approved carrier status reports that can tell you if you carry genes for certain inherited health conditions like Cystic Fibrosis, Sickle Cell Anemia and Hereditary Hearing Loss. They also include 8 wellness reports (lactose intolerance, for example), and 30+ trait reports (male bald spot, unibrow, etc.). Check out the following video to learn more about 23andMe’s health testing. 23andMe’s website includes important disclaimers that describe exactly what these tests do and don’t tell you regarding their DNA testing for health risks and carrier status. Each genetic health risk report describes if a person has variants associated with a higher risk of developing a disease, but does not describe a person’s overall risk of developing the disease. These reports are not intended to tell you anything about your current state of health, or to be used to make medical decisions, including whether or not you should take a medication or how much of a medication you should take. Our carrier status reports can be used to determine carrier status, but cannot determine if you have two copies of any genetic variant. These carrier reports are not intended to tell you anything about your risk for developing a disease in the future or anything about the health of your fetus, or your newborn child’s risk of developing a particular disease later in life. What About Other At-Home DNA Testing For Health Reasons? International Biosciences is a United Kingdom-based company that globally markets directly to consumers and claims a variety of disease risk and predisposition results. This company, however, doesn’t hold approval by any regulatory or scientific organization so it’s unclear how accurate their science and results are in determining genetic health risks. They also offer paternity and relationship testing, as well as wellness and lifestyle tests. TeloYears is a relatively new at-home DNA test that calculates the age of the DNA in your cells and claims to tell you how well you are aging. The test measures the length of telomeres, the caps that cover the ends of chromosomes (telomeres shorten as a person ages). It’s worth taking the test if you want to know how your cells are aging so you can make lifestyle changes. But otherwise, the science isn’t there yet. Companies like TeloYears claim that shortened telomeres are linked to age-related illness. The discovery of the link between telomere length and aging is relatively recent, and experts warn that not enough is known to interpret a link to illness yet. Large scientific studies have yet to prove a direct link between illness and telomere length. Fitness and sports genetics testing offered by companies like UK-based DNAFit claim that they can analyze your DNA to tell you the best, personalized way to reach your fitness and nutrition goals. But according to experts, there is no scientific predictive value in these tests. In fact, 23 geneticists from around the world released a consensus statement in the British Journal of Sports Medicine that begins, “The general consensus among sport and exercise genetics researchers is that genetic tests have no role to play in talent identification or the individualized prescription of training to maximize performance.” Sorry, fitness folks. Maybe one day! Rob, a personal trainer and nutrition coach from Minimal Fit based out of London, England used a DNAFit test to learn about this health and fitness. He shared with us his first-hand experience and what he learned from the results. It was interesting that I had a low sensitivity to carbs and fats, meaning I can eat more of them than most people without getting all of the calories from them. Good for staying in shape but not so good for my food bill! I have to eat more than most people to feel full and get my daily calorie requirements. The concept of learning about what your body responds best to from your unique genetic make-up is interesting. It also goes to show why some people respond well to low carb diets while others do not. What Else Can You Learn From 23andMe And Other DNA Tests? 23andMe is a unique DNA testing company in that it not only offers DNA medical testing, but it also gives you insight into your family’s ancestry. You can learn where your ancestors lived and locate living relatives. Be sure to check out our reviews of 23andMe and other ancestry DNA tests to learn more. Why are you considering doing a DNA test to determine your health risks? I’m kind of torn when it comes to these tests, like I’m curious to know what my chances are of getting a disease, but is there really much I can do about it if I’m doomed to get it?